Your organization functions and grows through conversationsface-to-face and electronic, from the mailroom to the boardroom. The quality of those conversations determines how smart your organization is. 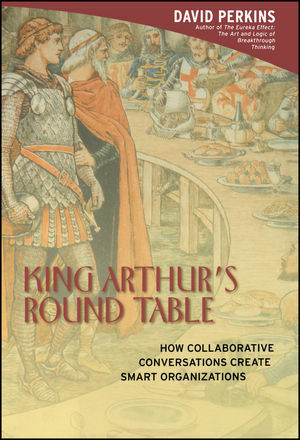 This revelatory book shows you how the Round Table of Arthurian legend can help foster collaboration and transform todays world of business, nonprofits, and government. "When I want a group to work effectively, I turn immediately to my colleague of thirty-five years, David Perkins. This book is a distillation of his knowledge and wisdom." "David Perkins applies his wit and inventive mind to create a fresh perspective on the world of collaboration in organizations. His archetypes and toolboxes offer valuable insights to anyone facing the challenges of collaborative problem solving." DAVID PERKINS is a senior professor at the Harvard Graduate School of Education. He is a founding member of Harvards Project Zero, a research outfit focused on cognitive-symbolic capacities and their implications for learning in all settings, and for many years codirected the project with renowned education specialist Howard Gardner. He is also the author of The Eureka Effect: The Art and Logic of Breakthrough Thinking, Outsmarting IQ: The Emerging Science of Learnable Intelligence, and Smart Schools: Better Thinking and Learning for Every Child. CHAPTER 1: KING ARTHUR’S DREAM. CHAPTER 2: ORGANIZATIONS ARE MADE OF CONVERSATIONS. How Round Is Your Table? Process Smart and Deciding Smart. People Smart and the Language of Actions. CHAPTER 3: YAKETY YAK AND FEEDBACK. Four Brands of Better Feedback. Findings from the Feedback Front. CHAPTER 4: THE DIFFICULTIES OF BEING OF ONE MIND. Difficulty 1: The Five-Brain Backlash. Difficulty 4: Regression in the Face of Stress. Difficulty 5: The Domino Effect. Difficulty 6: The Power Advantage. Are We Ready to Give Up Yet? CHAPTER 5: FROM LORDSHIP TO LEADERSHIP. CHAPTER 6: ANTS, WEATHER, AND ORGANIZATIONAL INTELLIGENCE. CHAPTER 7: COLLABORATION, NOT COBLABORATION. What Facilitation Does and Why It Is Not Enough. The Good: What Collaboration Means, How It Helps, and When It Helps. The Bad: The Pitfalls of Problem Sharing. The Ugly: The Challenge of Collaborative Citizenship. CHAPTER 8: CREATIVE CONFLICT, TRAGIC TRUST. Three Ways of Settling Conflict. Trust in the Land of Lear. CHAPTER 9: CLIMBING TOWARD CAMELOT. The Three Arts of Unlearning.